A radiant life deserves a uniquely radiant tribute, and our magnificent modern arrangement of roses, Stargazer lilies, Gerbera daisies and more will be a joyful celebration of the loved one who has passed. 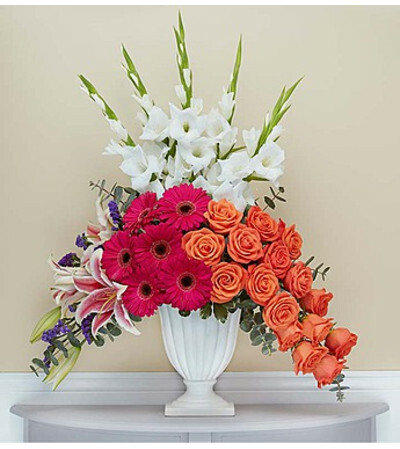 Groups of bright, bold, fresh blooms are displayed in a graceful keepsake pedestal vase. Elegantly crafted with satin finish and delicate fluting, a timeless vase that can be used to hold flowers or on its own as an objet d’art.